Flickering light bulbs are a common household electrical problem. Addressing the issue is a simple matter, but the approach you take will depend on the exact reasons for the flickering. In general, flickering lights are caused by a simple drop or fluctuation in household voltage that causes the lights to dim momentarily. A variety of common issues can cause your lights to flicker, and understanding the specific causes will tell exactly what to do to solve it. Fluorescent lights are more prone to flickering than LED and other bulb types. Temperature, bulb age, and warm-up cycles are common causes of fluorescent flickering. Small amounts of flickering aren’t a cause for concern, but if constant flickering or dimming are occurring, replace your fluorescent bulb to correct it. If the new bulb or tube flickers, it is likely that the fixture has a bad ballast. You can replace the ballast on old fixtures (upgrading to an electronic ballast in the process), but it's usually simpler to replace the entire fixture. Dimmer switches are a common source of flickering with LED bulbs. Older dimmer switches and current conventional dimmers are designed for use with incandescent light bulbs, and they often don't work well with LED bulbs. If your LED is controlled by a dimmer, the easiest fix is to buy a good-quality "dimmable" LED bulb. If that doesn't solve the problem, replace the old dimmer with a new dimmer designed for LED bulbs. You will still need to use dimmable LEDs, but the new switch will be optimized for LEDs and likely will give you better performance. 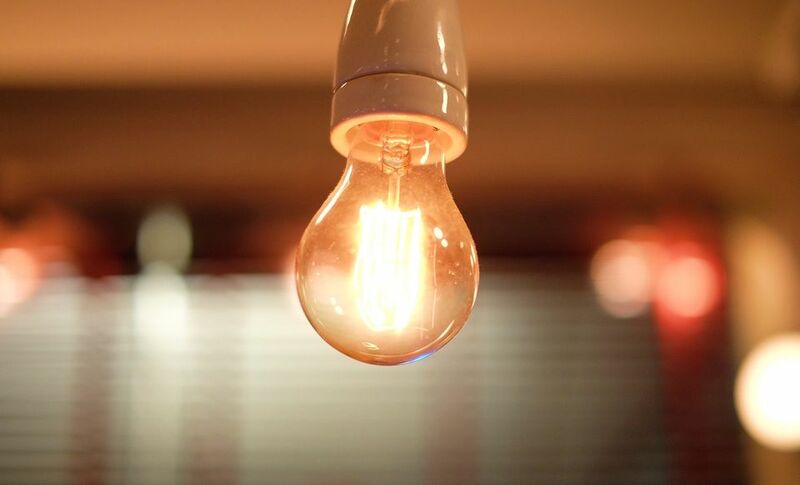 Bulbs that aren't screwed in all the way or are otherwise attached incompletely can make for a weak electrical connection with the light fixture's contacts, resulting in flickering. Simply tightening the bulb usually solves this problem. If this occurs with a fluorescent tube, try rotating the tube in the fixture mounts to make sure the metal pins on the ends of the tube are making good contact. A bad connection in your lamp or fixture’s on-off switch can result in flickering. Troubleshoot the connections by wiggling the on-off switch. If your lights dim as you do this, you probably have a bad switch. In-line cord switches are easy to replace. If the switch is part of a lamp socket, simply replace the entire socket (also an easy job, but it requires a bit of simple wiring). Cord plugs can also be the source of bad electrical connections. Make sure the cord plug is in good shape and is not loose in the electrical outlet. If necessary, replace the plug end or the entire cord. Large current draws can cause lights to dim but not really flicker. If you notice your lights dimming briefly when certain appliances (such as a refrigerator) kick on, or if the lights stay dim while a toaster or heater is running, the electrical circuit is overloaded and there's not enough current available for the lights. The bigger problem is that those high-demand appliances should not be on the same circuits as the lighting. Consult with an electrician; you may need to add one or more circuits to correct this problem. Or, if the light is on a lamp, simply plug in the lamp on a different circuit. Flickering lights are normally not a cause for alarm. But sometimes they can indicate a more serious underlying issue. Constant or severe drops in lighting can result from circuit overloads or faulty connections somewhere along the circuit. Both problems can be serious safety concerns and should be discussed with an electrician. Turn off the power. Locate your circuit breaker box and turn off the breaker that controls the power to the room where you’ll be working. You can turn off your power main (the main breaker) if you’re unsure which individual breaker controls your room. Remove the fixture's globe or cover to reveal the mounting screws holding the fixture to the ceiling box. Loosen the mounting screws to separate the fixture from the ceiling box and expose the wiring connections. Test for voltage in the circuit wiring, using a non-contact voltage tester. When you've confirmed the power is off, disconnect the light fixture wires from the circuit wires. Usually, this involves simply unscrewing wire nut connectors, but the grounding lead may need to be unscrewed from a green grounding screw on the ceiling box mounting strap. Connect the neutral lead on the new fixture to the neutral circuit wire, using a wire connector (wire nut). Neutral wires are typically white. This is sometimes a bit of a balancing act, as you must hold the fixture with one hand while attaching the wire connections with the other. Having a helper can be very useful at this stage. Connect the black (hot) fixture lead to the hot circuit wire, using a wire connector. Connect the grounding lead on the new fixture to the circuit grounding system. The fixture's grounding lead may be a green insulated wire or bare copper wire, while the circuit grounding wire is usually bare copper. Depending on how your old fixture was wired, this may involve connecting the fixture lead directly to a circuit grounding wire, or attaching it to the green grounding screw on a metal ceiling box, or both (metal boxes must be grounded even if there is a ground in the circuit wiring). Secure the fixture base to the ceiling box, fold the wires into the electrical box, and push the fixture toward the ceiling. Thread the mounting screws through the base plate of the fixture and screw them into the corresponding holes in the ceiling box mounting strap. Tighten the screws securely. Install the light bulbs. Choose bulbs that do not exceed the overall wattage rating of the light fixture. Attach the fixture's globe or glass cover. Turn the power on. Flip the breaker to the on position to restore power to the light fixture, and test to make sure it is operating properly. Installing basic light fixtures is a relatively simple job, but it does require some basic wiring skills. Call a pro if you’re unsure about tackling this project yourself.